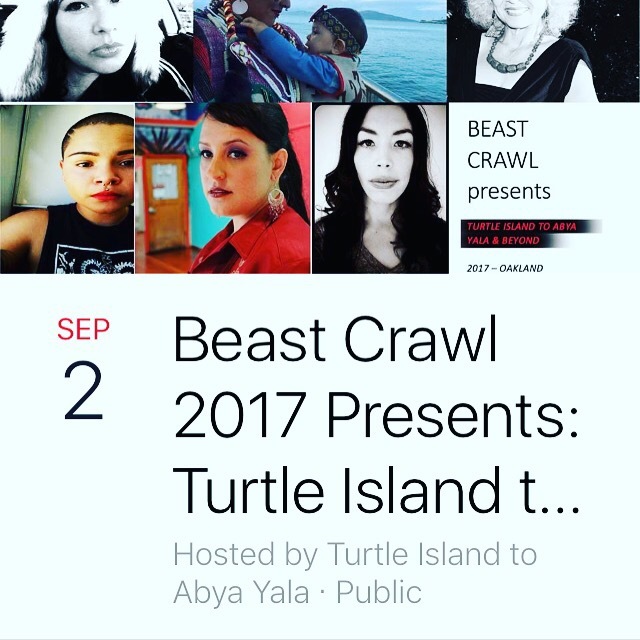 TURTLE ISLAND TO ABYA YALA began as a vision to unite Indigenous women from North and South America through art, poetry, and song. This began through the creation of the The Xochiquetzalli Award for Poetry and the anthology, Turtle Island to Abya Yala. This event will feature our community of women. All are welcome to attend and this is a free event. BEAST CRAWL is Uptown Oakland’s annual free literary festival featuring more than 200 writers in a single night, in dozens of events, spread out over four hours and thirty-seven local galleries, bars, restaurants, cafés, performance spaces, and storefronts. Nizhoni Ellenwood (NiMiiPuu Nez Perce/Apache/Italian), Artist, educator, dancer, singer, performer, and Mother from the Bay Area; BFA from San Francisco Art Institute; Co-Founder of the Indigenous Arts Coalition. An artist, academic, and athlete, Tria Blu Wakpa is a 2017-2018 President’s Postdoctoral Fellow in Dance at UC Riverside. She received her Ph.D. in Ethnic Studies from UC Berkeley. Maya Chinchilla is a queer femme Guatemalan writer and author of “The Cha Cha Files: A Chapina Poética.” She is a lecturer at UC Davis, UC Santa Cruz and SFSU. Moon Flower won the 2015 Robert D. Phelan Award for poetry. Her first book, Love and the Lost Nation, will be published in 2017. She enjoys the ocean, forest, and painting. Poet, Naomi Quiñonez is the author of Hummingbird Dream, The Smoking Mirror and The Exiled Moon. She edited an American Book Award anthology, Invocation L.A. She teaches Ethnic/Women’s Studies. Hablo Rodriguez-Williams is a Colombian/Mexican genderqueer warrior, intersectional feminist, published poet and organizer. Hablo’s work is featured in La Bloga, Mills College’ 580 Split and The Huffington Post. Each leg of The Beast lasts one hour, and offers a dozen different readings to chose from. There’s a half hour break between literary legs for socializing and relocating to a new venue before the next reading begins. We recommend choosing one reading per leg. You can even plan your route in advance. Crawl maps, curators, readers, and venues are all searchable on beastcrawl.weebly.com.